Scholarships are awarded to candidates who are part of the Armenian community in Syria and have fled the country due to the war. Candidates shall apply for this scholarship if they have interrupted their university studies or would like to start their higher education. If you meet the requirements above, please kindly send your application (attached) for a scholarship enabling you to continue your Higher Education or start it in the country you are currently living (except Armenia as the Armenian Communities Department of the Calouste Gulbenkian Foundation has a separate scholarship program for Syrian students in Armenia). It might happen that you will be offered a scholarship to study in another country. The current call covers the 2014-2015 Academic Year. Scholarships are provided for one academic year. After one year, the scholarship can be renewed for another one or two years, if the student passed annual examinations for promotion to the next academic year. The aim is that students complete a full cycle of study. tp.olagerodasacnull@snitramailerua by 30 JUNE 2014 (midnight, London time). Shortlisted candidates will be interviewed by phone or skype by the Selection Committee composed of Calouste Gulbenkian Foundation and Global Platform for Syrian Students representatives. The list of selected candidates will be available by 30 JULY 2014. “My deepest sincere greetings and gratitude go to all of you, who are contributing for the Global Platform For Syrian Students’ project, the project that reached out beyond the borders to help my Syrian colleagues and I to continue our education through these dark and hard times. I was born in Damascus, I grew up there, and studied there. My life plan was to continue my higher education studies, to give something back to my family, my people, and my country. But soon after the uprising started the country spiraled into chaos, and unfortunately the worst was yet to come; a vicious immoral war began. My family, worrying about our life and safety, opted to send my brother and I out of the country, I left my studies, my life behind and fled the country. I lost several colleagues to this war, loved ones who had gone missing, never heard of after, and many others traveled abroad seeking safety. My situation was extremely rough as my life kept spiraling from bad to worse. I couldn’t continue my studies, nobody cared about my qualifications, my future was ruined, and the situation took its toll on me both mentally and physically. Bad news and disappointments kept gushing out as my father, mother and two sisters were displaced inside Syria, forced out of our house under bullets, shelling and bombing. Our house, where my childhood memories reside got bombed, disappointments where accumulating, the anxiety and worry were so overwhelming that I reached a point where I was giving up, I was surrendering, until the day I got a phone call informing me that I got the scholarship. First I was in a state of denial, I couldn’t believe what I heard over the phone, suddenly there and then my heart started to race, I was flying due to happiness even though I was still not believing my own ears. For days after, I felt as if I was still dreaming. The effect of this scholarship on my life is enormous, and it has extended further beyond me and reached my family, the people around me, my relatives and my friends. My mother and father were in a deep grieving state over what had happened, given that their country is in war, their family got divided, displaced, the destruction of our house, their future as well as their children’s future looked bleak. However, when they got the news that I was awarded the scholarship, my mother got so happy as did my father. Somehow, it distracted them from all that grieve, and I felt happy that though I was unable to help them in these tough times at least through this scholarship I was able to give them a glimmer of happiness. My sisters, brother, cousins, neighbors, and colleagues who are struggling to continue their education, they were giving up, they needed hope as desperation crawled into their hearts. 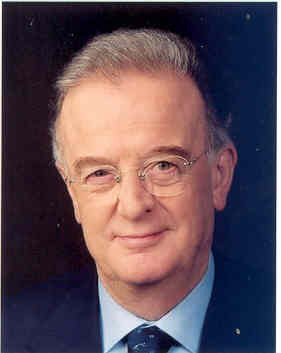 However, my scholarship served as an example that there is still hope; if you work hard, if you try, despite the bad situation, despite all the ordeals, and despite the horrors, one should not surrender, something can be done, and also that the world can still be a wonderful and nice place despite our fears. No words in this world can describe my feelings, my deep gratitude, my deep appreciation for granting me this opportunity, and this huge honor. I really hope that my other Syrian colleagues and peers get the same opportunity that I got. 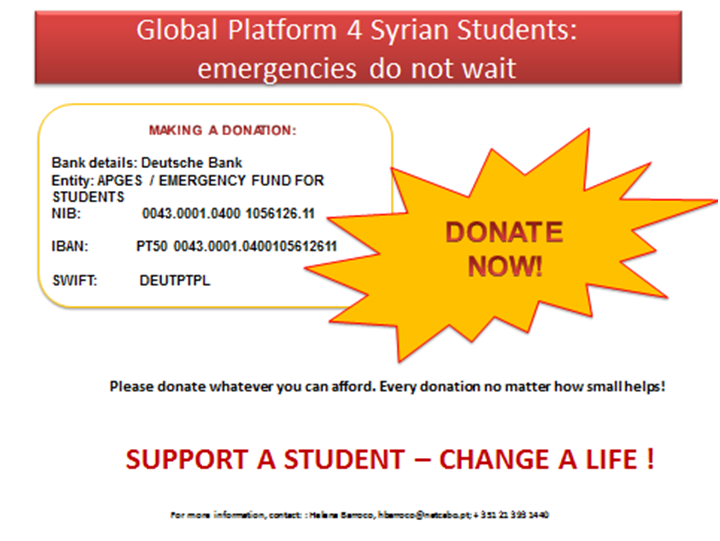 Thank you so much for submitting your application for the Global Platform for Syrian Students. We apologize for the delay in informing you of the results. The fact is that we received more than 2.500 communications, ranging from requests and questions to complete applications. So the selection process has taken longer than expected given the large number of candidates, but also due to the quality of the applications, which is impressive, making the decision-making process even harder. We understand your impatience. The results will be communicated personally to all those selected as soon as possible. Have patience. And do not be discouraged. Please believe that we are doing everything within our power to announce the results of the two calls for applications as quickly as possible. The announcement will be made individually, but this website will inform you when the communications are sent out. In the meantime we will also be exploring other possibilities for study, training actions, dialogue and online interaction. We are also working hard to create further study opportunities for and we hope that we will be able to make new calls for applications before the end of the year. Last but not least, we also plan to set up a blog and create a face-book page in order to create permanent communication channels with all of you. Keep hope alive. Would you like to continue your studies at the Higher Education level? If you meet the above qualifications, you are invited to apply for one of our scholarships enabling you to study in Lebanon, Turkey and in Iraq according to the country where you are now staying. This scholarship programme is the outcome of joint efforts made by a multi-stake-holders Platform aimed at helping refugee Syrian students to access higher education. This scholarship programme will cover all tuition fees as well as living costs for the 2013-2014 Academic Year. As an indication the following are main partners to this initiative: The League of Arab States; the Council of Europe; the International Institute of Education; a Consortium of Universities and Higher Education Schools; a number of governments, foundations, companies and individuals. The UfM Secretariat has also been providing assistance and advice to this initiative. Moreover, consultations are being held with the Secretariat of the UfM to develop further this initiative. Application forms must be completed and sent to tp.olagerodasacnull@snitramailerua by 15 SEPTEMBER 2013. The list of candidates for scholarships in Lebanon, Turkey and Iraq will be available by 30 September 2013. We strongly encourage qualified female candidates to apply. If you meet the above qualifications and you are a refugee, you can also apply for one of our scholarships enabling you to study in Lithuania or Portugal. This scholarship programme is the outcome of joint efforts made by a multi-stake-holders Platform aimed at helping Syrian students to access higher education. This scholarship programme will cover all tuition fees as well as living costs for the 2013-2014 Academic Year. As an indication the following are main partners to this initiative: The League of Arab States; the Council of Europe; the International Institute of Education; a Consortium of Universities and Higher Education Schools; a number of governments, foundations, companies and individuals. The UfM Secretariat has also been providing assistance and advice to this initiative. Consultations are being held with the Secretariat of the UfM to develop further this initiative. Application forms must be completed and sent to tp.olagerodasacnull@snitramailerua by 15 SEPTEMBER 2013. The list of candidates for scholarships in Lithuania and Portugal will be available by 25 September 2013.